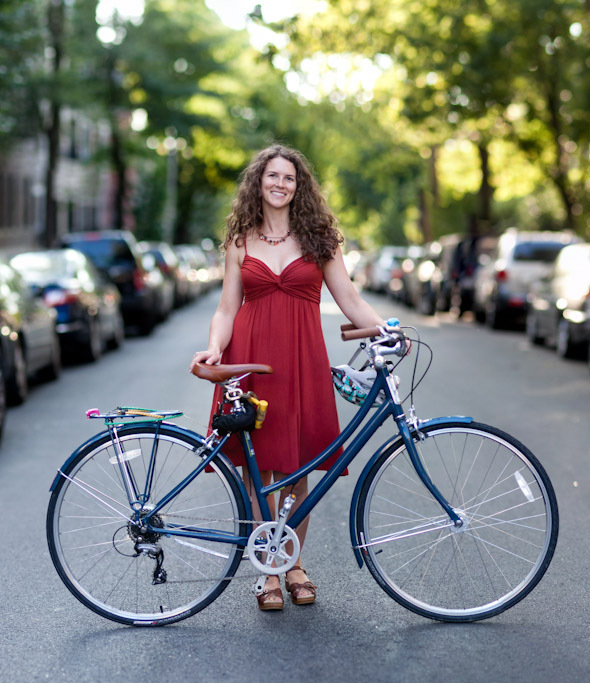 Here’s the 13th portrait in Streetsblog’s weekly “Why I Ride” series. Jessica is the fitness editor for Prevention magazine. She’s lived in New York for ten years, but has only been commuting from Brooklyn to Manhattan for the last couple of months. Not that she hasn’t been riding. She’s ticked up countless laps in Prospect Park on her road bike over the years, and even had a heavy old beater — a 1973 3-speed — that she’d take out occasionally. She was just never that comfortable riding in traffic. Recently she was researching and pitching a story about the health benefits of daily physical activity and how much of the rest of the world gets more of it (through walking and biking) than do most Americans. It occurred to her that maybe she could try riding to work. At the advice of a friend, she opted not to dive right into street riding but to ease in bit by bit. This started as a series of weekend rides around Brooklyn. Right away Jessica was pleasantly surprised by how much the network of bike lanes had been expanded since the last time she rode in the streets. The fact that she could ride from her house to the Manhattan Bridge almost exclusively on marked lanes made the whole endeavor feel much safer. She also picked up a new, more commute-friendly 8-speed bike. Not too long after that, in the company of a seasoned commuting friend, Jessica made her first trip over the Manhattan Bridge to her Midtown East office. Even then, she didn’t dive in. The first few times, she would ride to work, take the subway back, then ride home from work the following day. But as her experience grew, so did her confidence. On her blog, she has detailed some of her experiences, mistakes, and discoveries: watching out for potholes, not overloading your baskets, what to wear to the office, the importance of downshifting. To her surprise, she found that only a few weeks in, she was already giving advice and pointers on routes and navigating traffic to other new cyclists. Her blog is great. That is exactly the kind of media that makes cycling, growing your own herbs, etc. even more mainstream, accessible, and “aspirational” than it already is. The future is inevitable, and it’s common sense to get with it rather than fight against it. I have been admiring these photographers work. But the bokeh with this one is awful. It’s just that perfect blend of focus/out of focus that makes you dizzy to look at this image. Very difficult to look at. This is exactly how I see it. My two or three times-per-week commute to Streetfilms is now 22 miles roundtrip on a 52 pound Dutch bike. If I don’t get to the gym – and I don’t as much as I used to – I can still say I got a great workout in. And I think to many of the more and more bikes you are seeing daily, that is the selling point. as a photographer myself, i agree the bokeh is giving too dizzy an effect. think he’s using too much of a telephoto lens. an 85mm prime 1.4 lens would make a nice shot depending on whether this is a full frame camera or not. i think this is probably a 105mm persepective. Downshifting is easier with modern internal gearing, as you can do it after stopping. I do like that she keeps her helmet only in the background in this photo, and also in recent cycling-related photos on her blog she does not emphasize helmet-wearing. I don’t think the “workout” is the best selling point for everyone, though I am happy it works for you. Perhaps a better variant on this is that it “helps you feel great!” which can mean fitness and other things. hours what took me 10 years to figure out on my own. And they are free!!! Can’t beat that! Also, as long as your 3-speed was in perfect working order, it would have worked perfectly fine anywhere in NYC and would likely have been less prone to theft. A lady friend and I often go out for rides on ours that span 3 boros and can rack up 40 miles and more! I know I’m picking nits here, and I’m glad to hear that your having fun on your bike commute (I know do) but the century old 3-speed is a remarkable well suited machine for city riding. It just bugs me a little when people feel like a bike is inadequate just because it is old (at least that was the gist I got here). And that 3-speed probably had a chain guard to keep the chain grease off your legs and shoes!